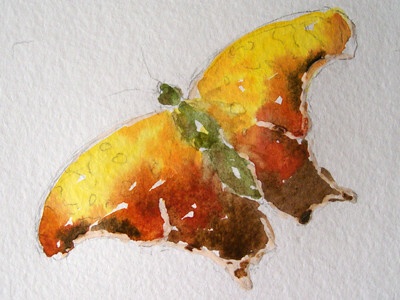 Let’s Paint a Butterfly – Let's Paint Nature! This post and painting is dedicated to my beloved friend and artist companion, Sharon, who was taken away too early in life today, 07-26-2010. She always encouraged me in my art adventures and was one of my best cheerleaders. Sharon also had incredible talent in art but had trouble finding time to settle down and paint. You may remember last December when I issued a ticket to a friend who was not practicing. That was Sharon and we had a good laugh. She did serve her ticket by the way, she came over and we painted and had lunch together. I will cherish those memories forever. Sharon was the friend from work who brough me autumn leaves from her neighbor’s tree because she knew that I am insane for autumn and love colored leaves. She always put others before herself and constantly thought of ways to make their life better. I will miss her unending optimistic character and bubbly personality. Working 9 hours a day together, we became family, seeing each other more that we saw our own families at home. We had no idea she was sick until it was too late. 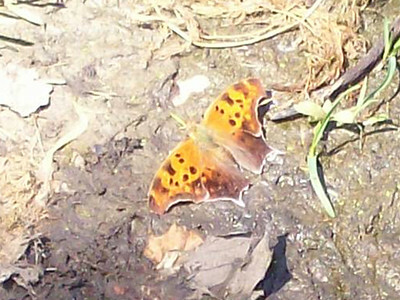 Here is our reference photo, a question mark butterfly at Papoose Lake in May 2010. 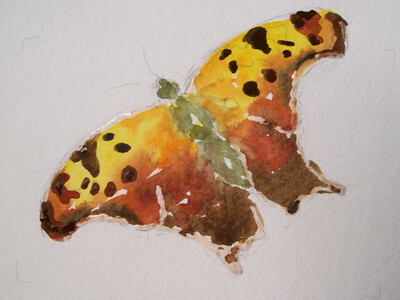 How can you tell a question mark butterfly from a comma butterfly? Look at the right wing near the top, there is a marking that looks like a little dash – that’s a question mark marking. The comma does not have this mark. Step 1: Make a sketch. I am using pencil on cold press watercolor paper. 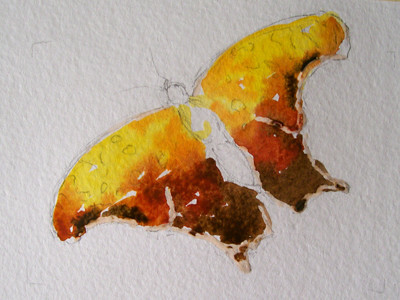 Step 2: Mask out a thin outline at the tip of the wings using masking fluid, let dry. 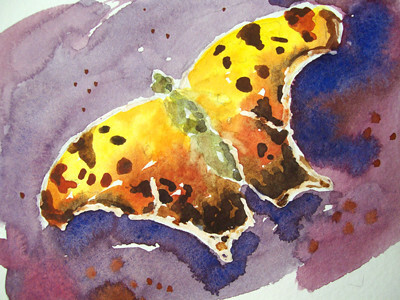 Paint the top half of the butterfly cad. yellow, the middle light red, and the bottom sepia. I let the colors touch and blend together, that’s OK. Let dry. Step 3: Paint the body using sap green and a tiny bit of the light red mixture so that the green is not too saturated. Step 4: When every thing is dry paint spots using sepia and maybe a touch of red. Don’t worry about being perfect with your spots. 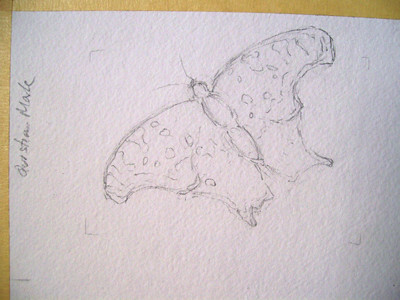 Step 5: Continue to make more spots and cover thicker portions of the lower wings with sepia. 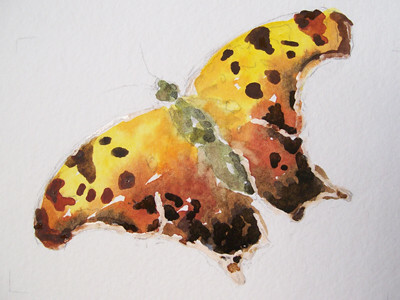 Step 6: Wet the background and paint a free splotchy background. I chose different shades of purple by mixing alizarin and cobalt. Purple represents passion and I thought it was fitting for the theme. Step 7 Final: When everything is dry, remove the masking fluid from around the wings and clean the edges by using a clean wet brush. Outline with micron pen if you choose. The original painting is a gift to Sharon’s sister. Her sister who has incredible sorrow also has incredible medical dept as Sharon did not have health insurance. High quality, acid free prints of this painting is available on Fine Art America. 100% of the proceeds made from this print will forever go to Sharon’s sister to help pay for medical expenses. So sorry to hear about your loss Chris. My prayers go out to you and her family. I like to think of all humanity as “angels with amnesia”. Your friend, Sharon, has arrived back HOME and I’m sure she remembers who she really is now – her Love will remain with you and her Love was the most important part of her, as it is for all of us. May we all try to remember how we arrived here and why we were created — to Love one another and know the Essence of God, as Sharon did. Carol: Thank you very much. Alanna: This is really comforting to me, I thank you very much. Ruth: Thank you very much, it means a lot. What a very beautiful tribute to your friend. I love what Allana shared with you. In One of The Stars …..
link above and ordered some ‘Sharon Be Free’ cards. I had never seen that site, Fine Art America site. VERY cool. to the original site where they are on the web. Thank you! Fine Art America does not give me any personal info, so I knew the cards were ordered but could not tell who ordered them. All of the money made from the cards will be sent to Sharon’s sister in Sharon’s memory. Thank you!!!! I love being able to do that….it’s such a GOOD feeling! Also, I have never heard of that site, but will look at it, sounds neat. Thanks for sharing. I too think if people played around more with art, they would be happier people. I am so sorry about your friend Cindy. Hold on to those memories and when you miss her, think of a funny time you had together. That helps me out alot. We will never let go of our memories…they are a gift from God! Stunning and Ohhhh so beautiful. !!!! Debra, I’m so glad you enjoy them!!! Sharon’s sister is thrilled too, I just spoke with her!!! I have some cards myself and was very pleased at the quality. Thanks again! 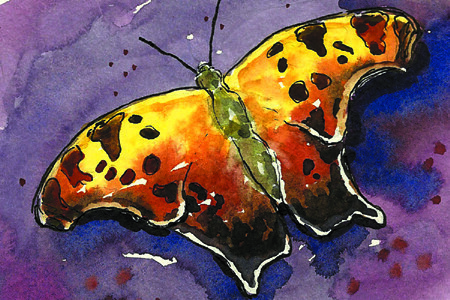 Pingback: To Give Life – Free Artwork – Merry Christmas | Let's Paint Nature! understanding anything fully, however this paragraph gives nice understanding yet.